Governments and leaders from around the world have quickly condemned the attack and used the “T word”. This includes the US, UK, Canada, France, and the EU, and many have also criticised the celebrations that have ensued amongst Palestinians, including in their media and by their leaders. UN Secretary-General Ban Ki-moon said that “there is no justification for terrorism nor for the glorification of those who commit such heinous acts.” The Australian ambassador to Israel went one step further and took his staff to the site of the murders to have lunch the next day – noting that they frequented the popular spot and the “terrorist attack … was felt deeply by the Australian Embassy”. In an interesting sign of the times, even McCully’s close friends the Saudis have condemned the attack. Yet more than 24 hours after the event, despite his focus on the region, McCully is still silent. 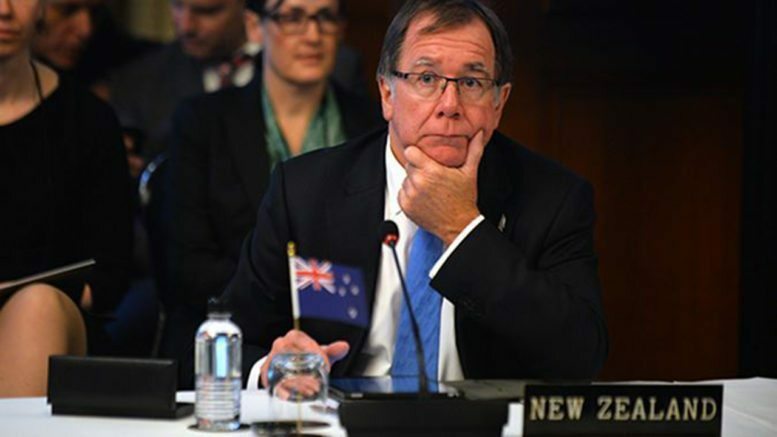 Wouldn’t it be nice if McCully publicly condemned this specific atrocity and the evil ideology that spawns it, and eschewed the Voldemort effect by finally pronouncing the ‘T’ word? Perhaps, rather than acknowledging, under duress, that Hamas has “stopped short of adopting the Quartet principles”, he could even criticise Hamas for praising the attack and calling for more of them during the holy Muslim month of Ramadan. Such statements might help to give credence to his assertion that he is “even-handed” when it comes to Israel and the Palestinians, and bolster his credibility. Man up Mr McCully. Words matter. If you want to consider yourself a real player on the world stage of international affairs, not just a pretender, follow in the footsteps of other world leaders. Condemn this barbaric act in unequivocal terms and give it its proper name. Terrorism.